You’re attracting positive attention, but you may prefer to direct this energy toward personal relationships or experimenting with creative ideas. A highly artistic period like this inspires all sorts of possibilities! Whether you re enjoying your favorite winter sports or taking new steps in tai chi class, you’ll prefer to stay active as a means to maintain sufficient energy to do all the things you have in mind. Nourish your nervous system with ample B-vitamins. A powerful time for love, the marvelous experience of opening your heart is perfect for the Moon on January 17. 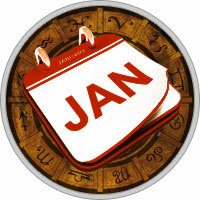 By the lunar eclipse on January 31, you clearly know what you need to do in the realm of relationships. Attraction to someone absolutely fascinating whets your romantic appetite, and if you’re reluctant to appear vulnerable you might at least send out a few interesting signals. The results may surprise you! Quiet reflection on your goals for the New Year during the Moon on January 1 allows you to visualize the perfect path to accomplishing your aims. Creative pursuits can be quite lucrative or may bring positive recognition after January 4, and from January 21 to 31 your ideas may provide much-needed solutions. Business meetings, conferences or publishing work to your advantage as well. An unusual turn of events brings financial improvement. Trusting your unique abilities leads to advancement of your personal agenda and also opens the doors for career recognition.